Need a simple checkup & cleaning? Give us a call! 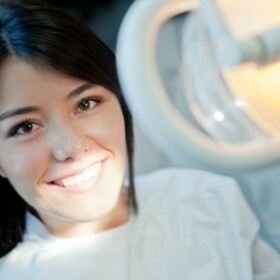 It’s good practice to visit your dentist every six months for a checkup and to have your teeth cleaned. Dr. Bundalo will also check your teeth for cavities and other issues, as well as look for signs of gum disease. If you’re a new patient, we recommend whole-mouth x-rays to identify any underlying issues that may otherwise not be visible with an oral examination. Dr. Bundalo will gladly answer any questions or concerns you have about your teeth or smile. Finding a dentist you can trust can be difficult. If you live in the Phoenix or Scottsdale area, we’d love to be your dentist! Dr. Bundalo is happy to provide you with a free consultation if you’re interested in our general or cosmetic dentistry services, or if you just need a simple checkup, give us a call! We pride ourselves, and strive to provide quality care in an honest and upfront way.